Fishermen in the harbor of Kochi, India. Fishing is the activity of trying to catch fish. Fishing can be done in the sea, or in a lake or river, and by boat or from the shore. Fish are normally caught in the wild. Techniques for catching fish include hand gathering, spearing, netting, angling and trapping. The term fishing may be used for catching other aquatic animals such as molluscs, cephalopods, crustaceans, and echinoderms. The term is not normally used for catching farmed fish. With aquatic mammals, such as whales, the term whaling is better. 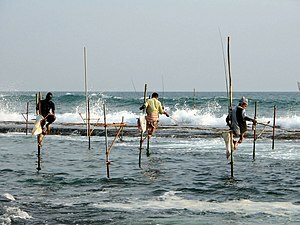 According to FAO statistics, the total number of commercial fishermen and fish farmers is estimated to be 38 million. Fisheries and aquaculture provide direct and indirect employment to over 500 million people in developing countries. In 2005, the worldwide per capita consumption of fish captured from wild fisheries was 14.4 kilograms, with 7.4 kilograms more got from fish farms. In addition to providing food, modern fishing is also a recreational sport. Fishing for money is a very dangerous job, because people can die or be badly hurt. Fishing gives a lot of food to many countries around the world, but those who take it as a job must often go far into the ocean under bad conditions. Commercial fishermen get many kinds of sea animals. This includes fish such as tuna, cod, and salmon, as well as invertebrates such as shrimp, lobster, clams, and squid. Alaskan king crab fishing is a famous example. 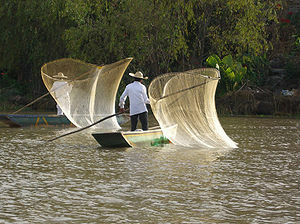 Ways to fish for money have become very simple, using large nets and machines to catch the animals. Many countries have made rules limiting how much fish people can catch, because some kinds have become scarce. Raising fish in the forms of aquaculture and mariculture add to the free-range catch of fish. Sport fishing is normally done with a fishing rod and line with any number of hooks to get the fish. This method is called angling. There may be rules that say how many lines and hooks one fisherman can use and how many fish he can catch. Anglers in fresh water catch many Black Bass (Black Bass includes the entire range of Bass fish), Pike, Muskellunge, Perch, Carp, Trout, Salmon, and Sunfish. Fish people get in saltwater include Swordfish, Marlin, Tuna, and others. Rules generally do not allow the use of nets and catching fish with hooks not in the mouth. However some kinds of fish can be taken with nets for bait and a few for food. Non-sport fish that are not said to be worth as much can sometimes be taken by many ways like snagging, bow and arrow, or even gun, because they are seen as competing with more valuable fish. Recreational fishing laws also include other life that lives in water, such as frogs and turtles. Sport fishing can be a contest where fishermen try to get more fish than other fishermen. This sport came from local fishing contests into a large contest in the U.S.A. where skilled fishermen can compete and be helped out by companies giving prize money, and other large contests around the world. Fish can also be collected in ways that do not injure them (such as in a seine net), for observation and study or for keeping in Aquarium. There is a substantial industry devoted to the collection, transport, export and farming of wild and domesticated live fish, usually freshwater or marine tropical fish. In the past, fishing has been so good for getting money that people began overfishing (fishing too much) - a serious problem that does lots of damage (bad). Overfishing does not always mean extinction, but simply that a fish type has been harvested so that there cannot be as many of that kind of fish as before. As more boats are sent out to catch the fish, many population levels of a type of fish can drop. Then, there are not enough of that kind of fish left to have new kinds of fish. Many times, fishing boats catch fish they do not mean to catch, called bycatch. All kinds of fish can become bycatch, and they are usually thrown back into the sea after they have died. Drift net fishing sometimes catches creatures like seals, dolphins, whales, and sea turtles. This kind of fishing made people complain. In the 1980s, it was guessed that 18 miles (30 km) of nets were lost every night, tangling up boats and animals. ↑ "Fisheries and Aquaculture". FAO. Retrieved 1 July 2012. Wikimedia Commons has media related to Fishing. This page was last changed on 13 December 2018, at 20:49.